from 15 pcs. 0,84 EUR ea. from 40 pcs. 0,75 EUR ea. from 80 pcs. 0,70 EUR ea. Bestseller: More than 2,8 million sold! Somewhere between a disc magnet and a rod magnet. With an adhesive force of almost 4 kg extremely strong for its size. Great value for your money! 1 pc. 2,70 EUR ea. 5 pcs. 1,24 EUR ea. This strong disc magnet works especially well on magnetic glass boards to hang up thicker cards. 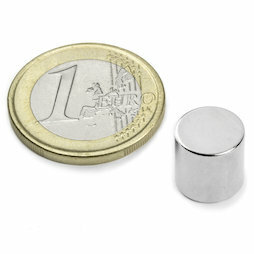 A medium-sized hammer is firmly held in place by this magnet.